You deserve a smile that’s happy, healthy, and beautiful; a smile that fills you with confidence and that you love sharing. You also deserve attentive, personalized care for your smile, delivered by a doctor and team who put you at the forefront of all they do. At Bellecare Dental, Dr. Stacy Pacheco and our team provide leading-edge, gentle care that improves lives, one person at a time. Unlike some dental practices, we schedule plenty of time for your visits and you’ll work one-to-one with Dr. Pacheco. You’ll never feel rushed, pressured, or overlooked. Instead, we’ll actively listen to you and encourage you to talk about your smile goals and any concerns you might have. We’ll ask about your life, hobbies, and overall health, too. The more we know about you as a person, the better we can meet your needs. Following your complimentary exam, and after talking with you at length, Dr. Pacheco will create your custom care plan. She’ll consider your clinical situation. She’ll also consider your goals, timeline, and personal concerns. This means you’ll have a care approach that works for you and your life. We’ll thoroughly review the plan with you. We’ll explain what’s recommended, why the doctor feels it’s the best treatment process, and the other options available. We want you to be engaged in deciding about your care: this is your smile, after all! We are committed to providing you the highest quality, modern dental care. We’re equally committed to providing you with exceptional customer care. We strive to make every interaction, and every visit, a positive experience. Please contact our Bellevue, WA dental office to schedule your consultation. We can’t wait to welcome you to our practice. 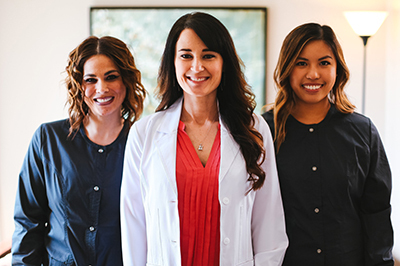 Dr. Pacheco and our team would love to start you on the path to a lifetime of optimal oral health and a smile you love. Call, today!